First post in a long time but glad to be back! This one was from a sketching trip from the cool harbour town Eyemouth just down the coast. It had been on the easel for quite a while but glad to have now got it finished and signed! I just got back from a walking holiday in Glencoe to find out I'd won the Pastel Guild of Europe's Get Dusty landscape competition with this painting- superb!! Can't wait to try out the set of Girault pastels prize, I've never seen them here in the UK. I just loved how these boats were sitting in the mud at funny angles and thought that it would make a good but challenging composition. The March edition of the Pastel Scribbler is now available for free download! There's some great tips and technique articles this month. Here's a new landscape painting I did. It is a dramatic sky over the view south/west looking down Loch Lomond. The view was stunning close to the second day of the West Highland Way and this point we'd just walked the length of Loch Lomond (~27miles) heading to a well earned pint at the famous Drover's pub. You can see one of the tiny islands that dot the Loch. I'm back from a bit of a Blogger break, can't believe its been so long since my last post. There was a fair bit of collage and layering of textures to get to this point. There's lots of subtle relevant inclusions as well that hopefully will mean there's a lot of looking longevity! My research on New York style building made me realise I'd picked architecture with LOTS of windows, phew! This is what I'm working on at the moment. 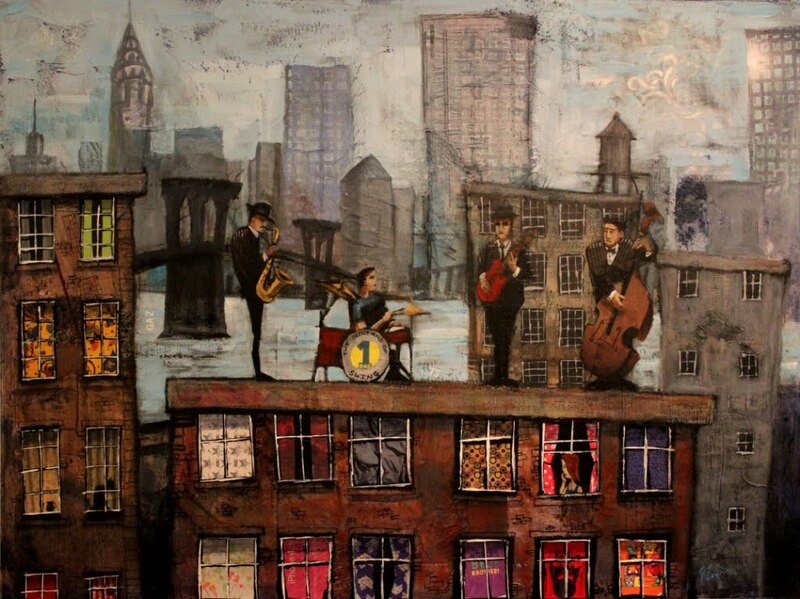 A new mixed media painting with a musical theme. This is for my brother's music studio so music is an obvious theme. 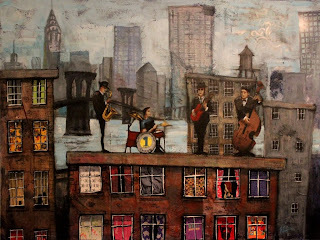 Continuing my current love for quirky buildings and rooftops I thought it would be cool to do a New York themed rooftop jazz / blues band. 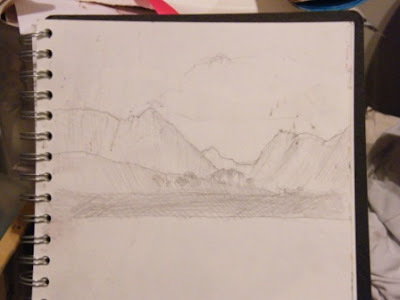 Another landscape from Arran. The previous Bastion painting was from the top left of the ridge looking down to spot this painting is from. Here we are looking back up Glen Sannox with the Bastion on the left guarding the entrance. 'The saddle' can be seen at the far end of the valley. We almost went that way till we say the descent!! Opted to come down 'the Devil's Punchbowl' onto the lush (and boggy!) slope on the left middle distance! This painting was started on Canson board but I have to say the surface did not suit my heavy impasto style. Lesson learnt. I used one of the Canson boards and used Colourfix 'Supertooth' pastel primer tinted warm red on top to give my grip for my thick pastel layers.